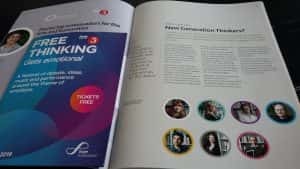 In case you missed it BBC Radio 3’s annual Free Thinking Festival took place at Sage Gateshead from 29-31 March. This year’s theme was emotions and the programmes featured will appeal to those of you studying Community and Youth Work, Creative Writing, Criminology, English Literature, History, Politics, Social Work and Sociology. If you missed taking part in the festival then Radio 3 is currently broadcasting the sessions from Monday to Thursday. You will be able to listen to them through the Free Thinking Festival page. The New Generation Thinkers’ sessions from the Free Thinking Festival are coming out on broadcasts of The Essay. The New Generation Thinkers are new academics/researchers selected and funded by the Arts and Humanities Council each year to learn broadcasting skills to communicate Higher Education research to a wider public audience. BBC Radio 3 and its Free Thinking Festival provide the stage for them to share this research and debate. Catch Lisa Mullen discussing Who Wrote Animal Farm? which examines George Orwell’s wife Eileen Blair’s influence on his work on Tuesday 9 April at 2245. Look out for the festival next year – attendance is free and you can either book places in advance or turn up on the day. University of Sunderland Spark Radio were at this year’s festival. Prospect Transformation 23rd March to August 2018; St Peter’s Library services will continue throughout this exciting redevelopment. Next story Time to revise? -Common pitfalls and how to overcome them.